WASHINGTON — A number of the reforms in Pentagon acquisition and business practices over the past few years have started to pay dividends, a senior Pentagon official said. Pointing to the latest batch of Selected Acquisition Reports (SAR) released Thursday, the official said that the closer eye that chief weapons buyer Frank Kendall has insisted that the building keep on its acquisitions costs has led to a reduction in the number of programs that have shot past their initial cost estimates. "We have fewer programs than last year overrunning their unit costs," said a senior Pentagon official who asked to remain anonymous. "Sixty-nine percent of programs are underrunning their baseline for unit costs" as well. "Asking the services to do their affordability analysis, that's made a big difference," the official continued. "We've gotten more serious over time and more structured" in how the building Department of Defense tracks its program costs. The annual SARs summarize the latest estimates of cost, schedule and performance status of the Pentagon's biggest acquisition programs. The F-35 joint strike fighter alone accounts for about 20 percent of the overall portfolio, which in this reporting period covered more than $1.6 billion in spending on 77 programs. But not all the news in today's report is good news. The Army's Joint Standoff Weapon (JSOW), an air-to-ground GPS guided munition, incurred a "critical" Nunn-McCurdy breach, something the Pentagon attributed to drops in procurement on the weapon in the fiscal 2016 budget request. The program unit acquisition cost ballooned by 45.8 percent as procurement of the AGM-154(C) "Unitary" variant dropped from 7,000 to 3,185. More gGood news for the Air Force came in the form of a 4.2 percent drop in costs for the Evolved Expendable Launch Vehicle (EELV) program, under which all military space launch is handled. That savings is the result of cost revisions in projected amounts from fiscal 2021 to fiscal 2030, and came in spite of two additional launches being added and extra funds being set aside for the development of a new American rocket engine. Program costs on the FAB-T terminal system also dropped, to the tune of $555.2 million or 11.5 percent. On the other side, program costs on the Joint Direct Attack Munition (JDAM) jumped by 13 percent, or $939.0 million. No need to worry there, though — that cost is directly related to the fact the US needs more tail kits for the weapons, increasing its buy by 31,509 over last year as daily strikes against the Islamic State group continue. But perhaps the best news for the Pentagon overall is the $7.7 billion cost reduction for the F-35 joint strike fighter. The F-35 is set to be the backbone of American air power for the foreseeable future, but has a well-earned reputation as a budget hog. Program officials and industry executives have said they are focused on bringing costs down, and Pentagon auditors seem to agree, citing work by prime and subcontractors to drive down those price tags. The current average F-35A price is $108 million — with the engine — which is $4 million lower than previous estimates. A spokesperson for the F-35's Joint Program Office said the team has taken "a disciplined approach to analyzing and reducing sustainment costs. Ongoing activities include conducting a sustainment business case analysis and operating a cost war room to find program savings and attack operational, sustainment and total ownership costs." 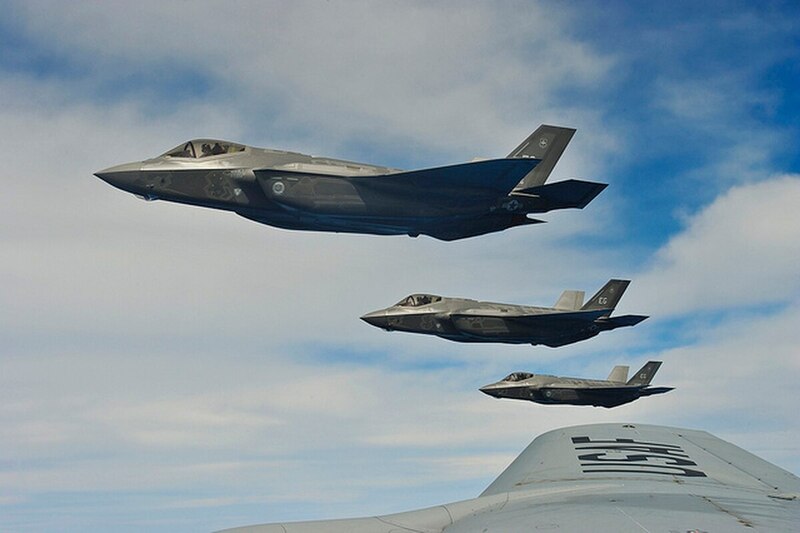 Lorraine Martin, F-35 program manager at Lockheed Martin, said in a statement that the company is "extremely pleased with the nearly $60 billion decrease in operations and support costs of the F-35 program during the last year alone." Martin added that there are numerous other initiatives in place, "including the Blueprint for Affordability, that will drive program costs even lower ... by the end of the decade." For the Navy, costs increased $4.3 billion for the DDG 51 Arleigh Burke-class guided missile destroyer due primarily to a quantity increase of two2 ships, from eighty to eighty two 80 to 82. Costs also increased for the EA-18G Growler program by $1.5 billion due to the decision to buy 150 more planes, as opposed to the previous 135. The Pentagon also reported that the backbone of the Army's communications network breached Nunn-McCurdy thresholds. The Warfighter Information Network-Tactical (WIN-T) Increment 2 and 3 will be partially combined and reduced, a move which caused the breach. WIN-T Increment 2, the networking-on-the-move portion of the program, experienced a surge in unit cost when procurement of nodes was cut from 5,267 to 3,583 and the procurement schedule was extended by two years. It was classified as a "significant" breach. The program is seeking a full-rate production decision in May, according to Paul Mehney, a spokesman for Program Executive Office Command, Control Communication-Tactical. Meaney attributed the breach to, "anticipated fact of life program changes and does not require WIN-T Inc 2 fielding and development efforts to stop." In June, the Army announced it would defer Increment 3, the network's aerial tier, due to fiscal constraints. The move equates with a cost drop from $3.7 billion to $1.9 billion reported in the summaries. In 2014, the Army shifted hardware procurement from Increment 3 into the Increment 2 program and extended the fielding schedule for Increment 2 by ten 10 years. The Joint Tactical Radio System Handheld, Manpack, and Small Form Fit Radios (JTRS HMS) program costs fell from $12.2 billion to $10.5 billion, due primarily to revised estimates for manufacturing, initial spares and support costs. At the Army Network Integration Exercise at Fort Bliss, Texas, last May, the Pentagon's Director, Operational Test and Evaluation (DOT&E), found the radio "not operationally effective when employed in dismounted operations, operationally effective for mounted operations, and not operationally suitable." Soldiers testing the Manpack, meant to serve tactical units with simultaneous voice and data communications in the field, faulted its range and reliability in certain cases, its weight and the heat it generated.